Call for Artists DEADLINE EXTENDED TO January 18TH! In 2010, bioarchaeological analysis was completed by the NYS Museum. The analyses determined that the remains are about 200 years old and represent 6 women, 1 man, 2 children, and five infants. DNA analysis concluded that four of the individuals are of African descent. (West/East and Central Africa) Two sets of remains are descendants of women from Madagascar (off the coast of Southeast Africa). One individual, who may have been of mixed ancestry, was descendant from a Native American woman (possibly Micmac Tribe: Eastern Canada and the Northeastern corner of the United States). The burial ground was dated between the 1700s and early 1800s. Historical research indicates that the burial ground was part of a large estate owned by the colonial Schuyler family who owned a number of slaves in the 18th and 19th centuries. The Schuyler Flatts Burial Ground Project Committee is in the process of planning and implementing a ceremony at St Agnes Cemetery located in Menands, NY on Saturday, June 18th 2016. All burial containers will be used as funerary containers and buried filled with a set of remains. The containers will be on display during two ceremonial events, but there is neither honorarium nor financial compensation for participating in this project. All work and the final containers will be donated to the project. Each artist will have the opportunity to discuss their work at one of the events. The remains will lie in state at the Schuyler Mansion State Historic Site on June 17th 2016. The containers will be the honored resting place for these ancestors. • A visual/graphic representation which accurately reflects the appearance of the final built piece in JPEG, TIFF or PDF format, the graphic should include views from the top, side and front. 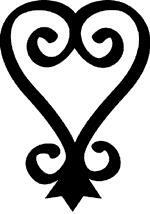 The design should incorporate the symbol Sankofa referenced in the previous section. Groups of artists and craft people may apply jointly.